Happy Saints: 30% off Jesus’ Family & Friends eBook! 3 days only! 30% off Jesus’ Family & Friends eBook! 3 days only! 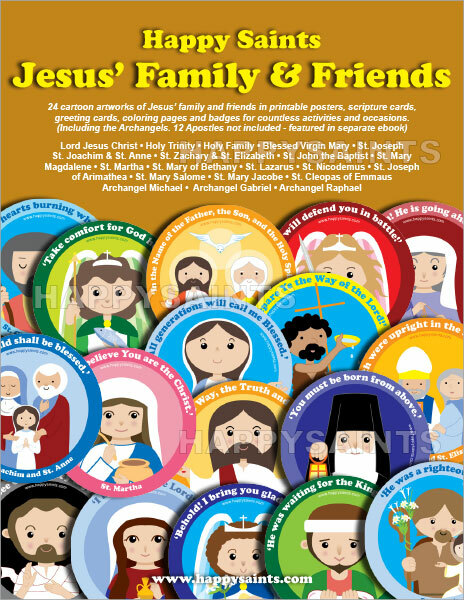 Happy Saints Jesus’ Family & Friends eBook features 24 cartoon artworks of Jesus’ family and friends (Apostles not included, featured in separate ebook) with short Gospel passages, in printable 8x10 posters, prayer cards, greeting cards, coloring pages and badges. Featuring: Lord Jesus Christ, Holy Trinity, Holy Family, Blessed Virgin Mary, St. Joseph, St. Joachim, St. Anne, St. Zachary, St. Elizabeth, St. John the Baptist, St. Mary Magdalene, St. Martha, St. Mary of Bethany, St. Lazarus, St. Nicodemus, St. Joseph of Arimathea, St. Mary Salome, St. Mary Jacobe, St. Cleopas of Emmaus, Archangel Michael, Archangel Gabriel and Archangel Raphael. Very useful resource for parents, teachers, catechists, children and families! 30% off until January 31, 2018. View details and download the PDF ebook now (no promo code required)!